With the excesses of some of today’s birthday parties, it’s easy to get carried away in spending to host the perfect celebration. Don’t forget that frugal people can have fun too! 1. Choose a free location. Have the party at your home or in a public place that doesn’t charge to use its facilities (such as a park or playground with picnic tables). 2. Time the celebration for mid-afternoon, between lunch and dinner. If you hold the party when people are likely to have full stomachs, you can skip serving a full meal and get away with having just snacks and birthday cake. 3. Take advantage of stores’ birthday freebies. Many grocery stores offer free cakes for first birthdays, and with birthday clubs, older kids can earn cake or other goodies that can be put to good use for parties. 4. Make your own cake. Homemade cakes – even those made from a box – usually taste better and cost less than store-bought cakes. 5. Make your own entertainment. Rather than hiring a deejay, a clown, and an animal trainer for pony rides, bring back some of the party games you loved as a child. 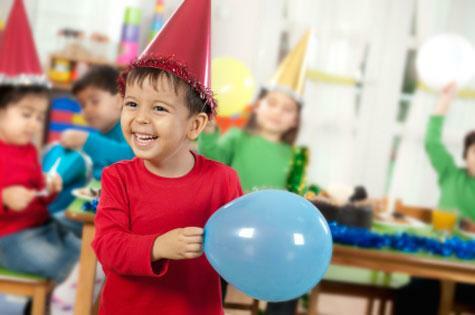 Even kids who are used to elaborate birthday parties may appreciate the change of pace and find themselves having a great time bobbing for apples or pinning a tail on a donkey. As with cake decorating ideas, inexpensive party games are readily available online and in books or magazines. 6. Ask guests to share their skills in lieu of gifts. This idea works better with older teens and adults, once the present-opening becomes less of a focus to the party. Ask one friend to bake the cake, another to share his vast music collection, and a third to put together some ice-breakers. 7. Combine favors with a party activity. Let kids make something fun that they can take home instead of a goody bag. For example, buy beads for a tween girl’s party and let the guests make themselves bracelets and necklaces. Or make silly hats to wear during the party and take home later. Nearly any kids’ craft can be turned into a favor. 8. Choose a general theme, rather than a specific one. In general, any decorations and favours with a trademarked character or logo will cost more than materials with a general theme. General themes also allow more leeway for creative activities. For example, “sports” will let you make a cake shaped like a baseball, use basketballs for party games. Try “bring your favourite stuffed animal” for an animal-themed kids’ party or ask guests to name theme songs old and new for a television-themed party. A masquerade party can be fun at any time of the year, and the costumes can serve as conversation starters. Host your own talent show instead of buying those American Idol plates and napkins. 9. Invite people over the phone, in person, or by email instead of buying paper invitations. If you want to make sure they have party details on paper, send postcards, which can be made inexpensively, and save on postage. 10. Reuse party supplies when you can. Plain plastic or cloth tablecloths, candles, and some decorations can be used more than once. You may even start a tradition by using a particular item year after year or for all your family’s parties this year. However you choose to celebrate, enjoy the party, and don’t be intimidated by your neighbours’ big bashes. Remember that the amount of fun you and your guests have doesn’t depend on the amount you spend. In fact, many guests may feel more comfortable at an old-fashioned, people-focused (rather than event-focused) birthday celebration and be relieved by not having to top your party spending when their own birthdays roll around. What’s your money saving tip for parties? As a grannie I recall children’s parties as something tobe endured not enjoyed! These suggestions are very apt. I recall a very good suggestion made on this site in connection with Christmas - ‘it is always better to give an experience than an object.’ A party is the ultimate experience for a little one - the challenge is to make it a positive one!